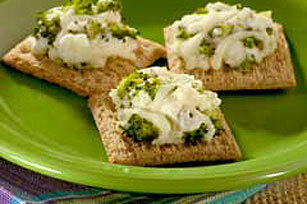 Top hearty crackers with chopped broccoli and a blend of Italian-style cheeses to make tasty pizza-style appetizer bites. Combine all ingredients except crackers; spread onto crackers. Place in single layer on baking sheets. Bake 5 min. or until hot and bubbly. Serve warm. Prepare as directed, using KRAFT Shredded Low-Moisture Part-Skim Mozzarella Cheese, KRAFT Grated Parmesan Cheese and woven wheat crackers. Substitute 1/2 cup sliced stuffed green olives or chopped sun-dried tomatoes for the broccoli.